One of the sad truths of taking the lead in a trip like this is that people may follow you when you don't know where you're going. And that in one sentence is the story of how Steve joined the four of us at Threadgill's gospel brunch. 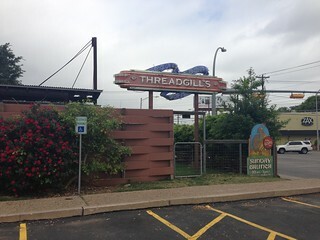 I thought that Threadgill's gospel brunch would offer us a way to get two desirable things at once: we could get good food at Threadgill's, and sample another slice of Austin's music scene. Unfortunately, instead of getting two good things together, we got two mediocre things. The brunch buffet was perfectly serviceable, but it was just a brunch buffet, distinguished only by two things: it included migas (albeit not splendid migas), and it served salsa in the largest bowl I can recall used for serving salsa. There was probably two gallons of salsa in a large metal bowl. The gospel was not what I had hoped for either. We were seated in a different room from the musicians, so it was hard to hear them over the sound of our own conversation. Because I didn't hear them well, I can't say much about the quality of the band, but I think that if they had gotten the room clapping, we would have heard it. Chris suggested that we order the chicken fried steak, to get a sample of one of their specialties that wasn't on the buffet. It was certainly a good chicken fried steak, but I had been hoping for an outstanding one. We finished at Threadgill's with enough time to pay a visit to John Mueller Meat Company. This visit itself was a fortuitous result of our trip to Royer's Round Top Cafe the night before, because Bud Royer had said that the best barbecue to be had in Austin was at Franklin Barbecue and John Mueller's. 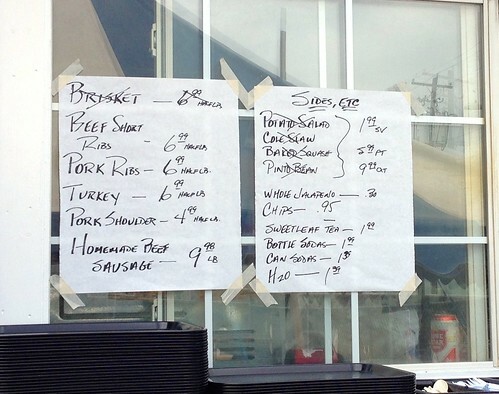 Now, I only know of changes in the Austin barbecue scene from scrumptiouschef's posts to the Roadfood forums, but I had been under the impression that John Mueller had been kicked out of the business bearing his name. But because Bud Royer mentioned him, I did some research that morning: John Mueller had indeed been fired from one business earlier in 2013, but he had started a new enterprise, John Mueller Meat Company. 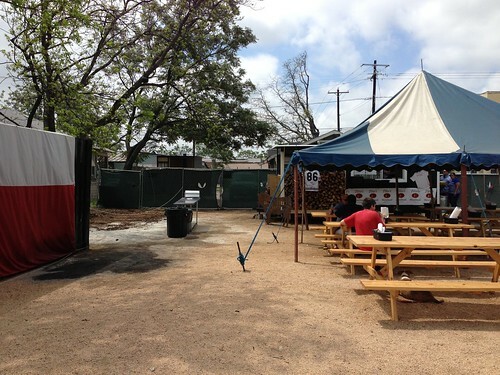 John Mueller Meat Company was a food truck in a fenced lot of its own. and some sausage. The sausage had a very heavy hand with the black pepper, so much so that the bite of the pepper clobbered all the other flavors. Steve thought through the lack of brisket and concluded that if he was to sample beef at John Mueller's, it would have to be in the form of the beef ribs. Then he added pork ribs (behind the beef ribs in this picture). Both species were very tasty, but the beef ribs were particularly notable, succulent and unctuous with rendered fat, with a flavor-packed bark.